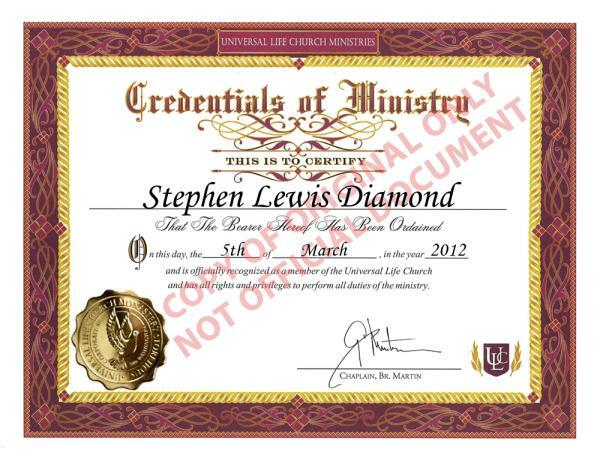 As Stephen Lewis Diamond, I have been ordained as an [atheist] humanist chaplain, by the Universal Life Church Monastery. To promote freedom of religion. To do that which is right. Proof of my receipt copy, and that my personal information and ministerial standing has been recorded in the Church database. How nice of them, to have updated my receipt certificate with a nicer look! This entry was posted in "Our Boy of Perpetual Joy" Garden and Sanctuary, Blog.com Archive on March 5, 2012 by eqfoundation.